For the past several weeks I’ve been using Jason Chandler’s PA 28-161 as my trainer in the sim. I train in a Warrior II in the real world, and in P3D and X-Plane I’d never found a simulated aircraft that had quite the right flight characteristics, especially in the pattern. I’m happy to report that Jason’s Warrior III has the flight model nailed. Even better, Jason sells this bird as part of a Piper Package that includes 14 Piper aircraft (with Archers, Arrows, Saratogas, and more) for $15. Yes, you read that correctly. All look great and, from what I’ve read online, have flight models that are dead-on. While they may not have all the cockpit sounds etc. that you might find in a Carenado or other “corporate” payware aircraft, they all look great, fly right on the numbers, and were easy to modify for my cockpit layout in Planemaker. In our hobby there are few places you can get solid aircraft for $1 a piece, but this is one. If Piper’s aren’t your thing, Jason makes several other aircraft, including several jets, a series of Beechcraft birds, and a set of Cirrus SRs that are good enough to be used by Cirrus for training. I do think I may be getting one of those as well. See all his aircraft here. 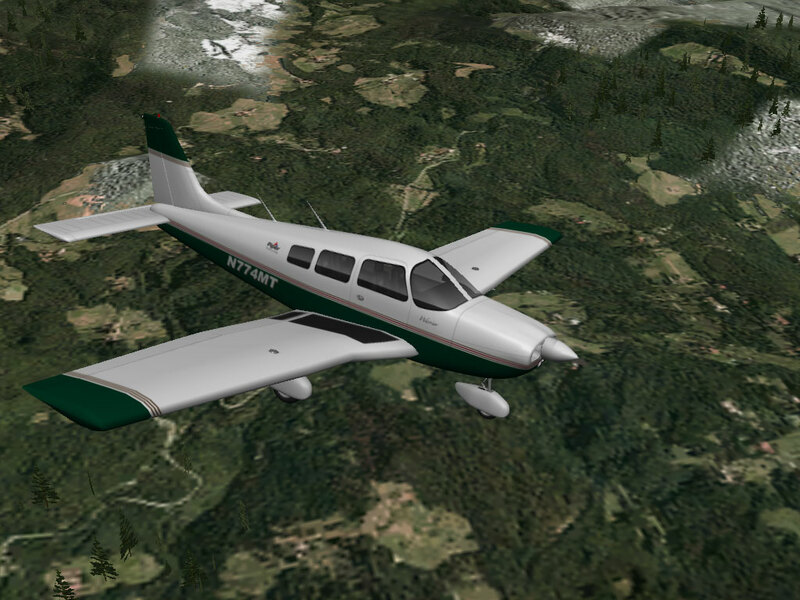 Just curious if you had ever tried the A2A Piper in P3D? If so, how would you compare it to the Chandler? I always flew the A2A Cherokee because it was the closest model I had found to the Warrior I flew in my training days. And since I’ve joined the “dark side” (as Jiva would say) I’m looking for something like that in XP11. Thanks for your time, and the great information. Hi Tommy. In P3D I flew the A2A as well just for that reason. But for the Warrior I found that Cherokee was never quite right on the numbers. The power settings in the pattern were off, and it would really hang on the prop when I tried to stall it. The real thing does, too, but it will pitch over. Once in the A2A I literally couldn’t stall the thing in slow flight. The Chandler bird feels right on. It’s quite sensitive on the controls, so I may lighten them just a bit, but the numbers in the pattern are pretty much the same as what I fly real world. I like it a lot, and you can’t beat the price. Also – expect it’s not going to have all the bells and whistles of the A2A, but I never used them anyway. The only thing I miss is the cabin sounds, but that really isn’t much to miss. The visual models are still quite good given these were designed for XP-10, and as I understand it he updates his aircraft for new releases. Jason has been designing planes for as long as I can remember. The early days of X-Plane. I’ve purchased several planes and they are amazing. I wondered what happened to him, until I read your article. He has his own website now. Thanks for posting. I went and bought the plane too. Thanks for all you do with our loved hobby. Based on the comments here, I decided to give the Pipers a try. Does anyone have an .acf file for the 161 that works in the sim. I can’t manage to get rid of the (bare) panel (which sticks out on the right) nor the black blob that is where the compass goes (the compass has been removed). Any experience / comments on how Jason AC “Behave” in VR, & further more, is there away to assign switches & buttons to his Avionics instruments, like the Avidyne PFD Etc ? Hey basement fly guy….Thanks for the link to Jasons site. I just bought but havent used the piper PA28 yet in my home cockpit (the build is almost exactly like yours). Question: You edited the C172 in XP11 to make it work with the 3 screen setup in the home cockpit and were gracious enough to share it (thank god, because without it I wouldnt have had success with my build…. So…Do you have to or did you edit the piper so it would look right in the home cockpit? Please let me know…. Yes. It was much easier. Deleted some cockpit objects and that was it. Hi BFG, after looking at all of the misc objects (for Jason’s PA28 161) in planemaker, I also thought this would be a piece of cake to modify for my home cockpit, just like I did for X-Plane’s default 172SP (with help from your 172SP .acf file). But I’m having the same issues as those above who’ve tried. Would you be willing to share your PA28 .acf file(s) so I can see what I’ve done incorrectly? Thanks so much! Love all that you’ve shared on YouTube and your website . . . that’s what motivated me to build my own home cockpit (still under construction)! That’s not very easy for me because they’re on the sim PC from which I don’t blog. If I have the time I’ll copy and post them.